On October 10, it was quite an adventure simply to get to the memorial service for the martyrs of Maspero. ‘The church in 6 October City,’ is what both people and press related, and Google Maps said there is only one, downtown. 6 October City is also one of Cairo’s satellite cities, and thus not very easy to access. But the name of the church – St. Michael’s – did not match the name of the church on Google. I was faced with the choice of having to taxi out and hope it was correct, which would be quite expensive, or discover the routes of public transportation, which would take me downtown and then leave me there. In either case I was not confident the only church in town was the right one. 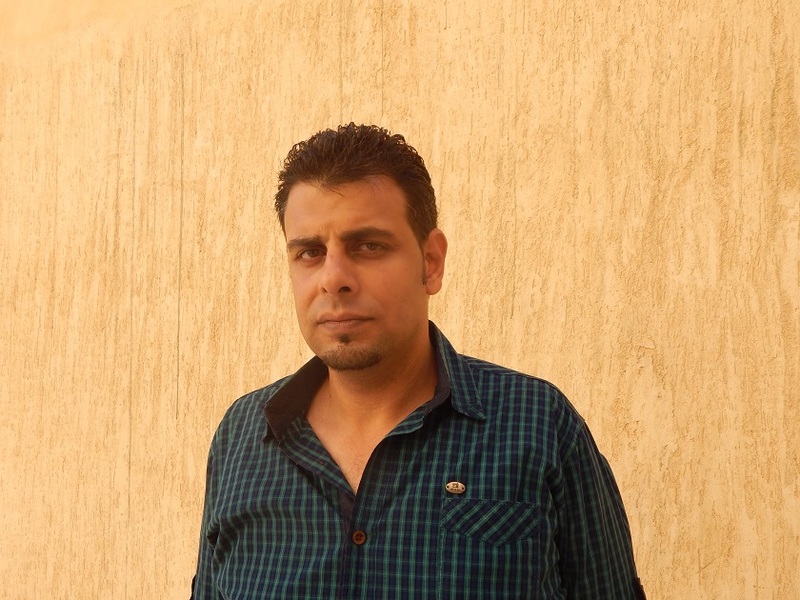 In the end I contacted Wael Saber, described in my earlier article as one of the spokesmen for the Union of the Families of Maspero Martyrs (UFMM), to try and double-check the location of the memorial service. He proposed a solution without which I would have been completely lost. I could meet him at 7:30am in downtown Cairo, where he was arranging a bus to transport dozens of relatives. Within the controversy described in the article, this bus was good evidence that Saber is indeed appreciated by at least many relatives as the spokesman of the group. More below will contest that claim, but as we weaved out of Cairo and through the expanse of land on the way to 6 October City, we did not quite reach it. Instead the bus veered to the left, out into the desert. I had no idea where we were headed, but I’m glad I searched Google thoroughly looking for a second church. I did not find one, but on the outskirts of town was a new cemetery, and it quickly became clear we were now driving through it. The sign reads: Cemeteries of St. Michael, 6 October City. 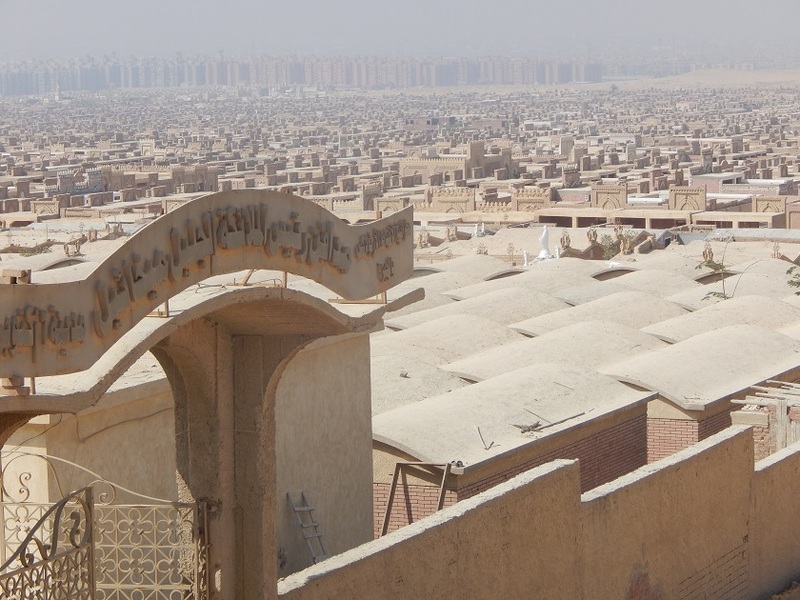 The vast gray expanse behind are the Muslim graves. The majority of the mausoleum structures were clearly for Muslims, but as we drove through to the back of the cemetery a huge church rose up above the whole area. It was odd to see the massive structure with no comparable mosque nearby. Later, a church employee told me the size was necessary to hold mourners for the funerals held here, especially given that the remains of the martyrs of Maspero often attract a crowd. The church does hold regular mass, he also said, but busses in the worshipers from surrounding areas. St. Michael’s Church. The sign to the bottom left says ‘Come to me’, with Jesus speaking to Maspero martyrs. 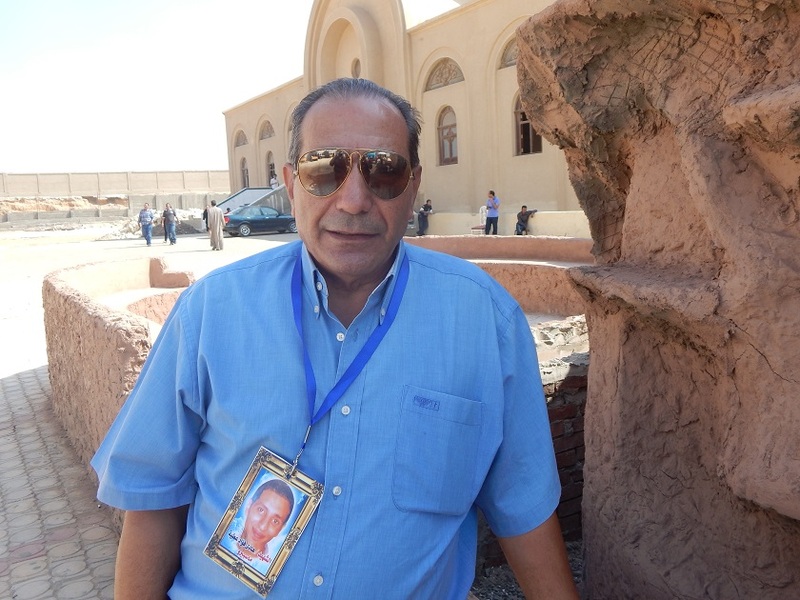 I spoke with him outside the crypt holding the remains not only of the Maspero dead, but also those killed in an earlier attack on a church in Imbaba, Cairo, as well as those killed in a later drive-by shooting during a wedding in the Cairo neighborhood of Warraq. 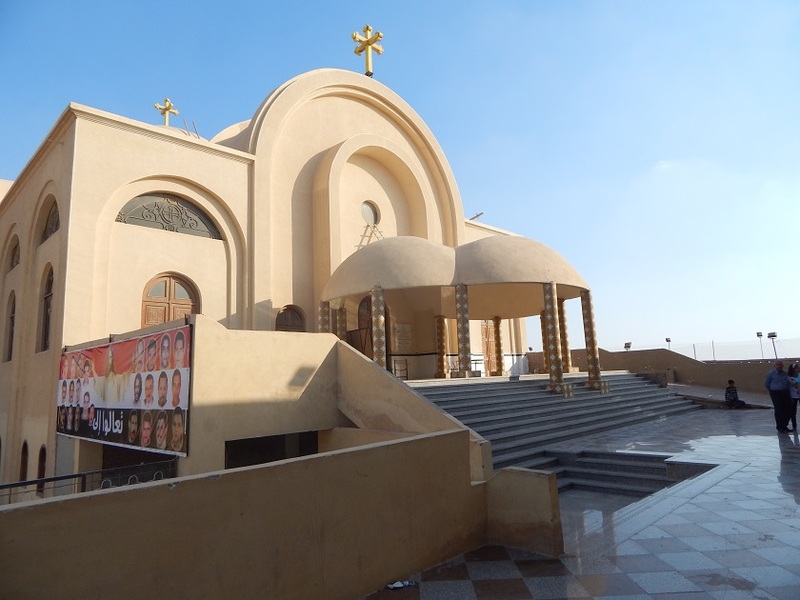 The church was built in 2011, and Saber told me he has papers stating church leadership will rename it to the Church of St. Michael and the Maspero Martyrs. 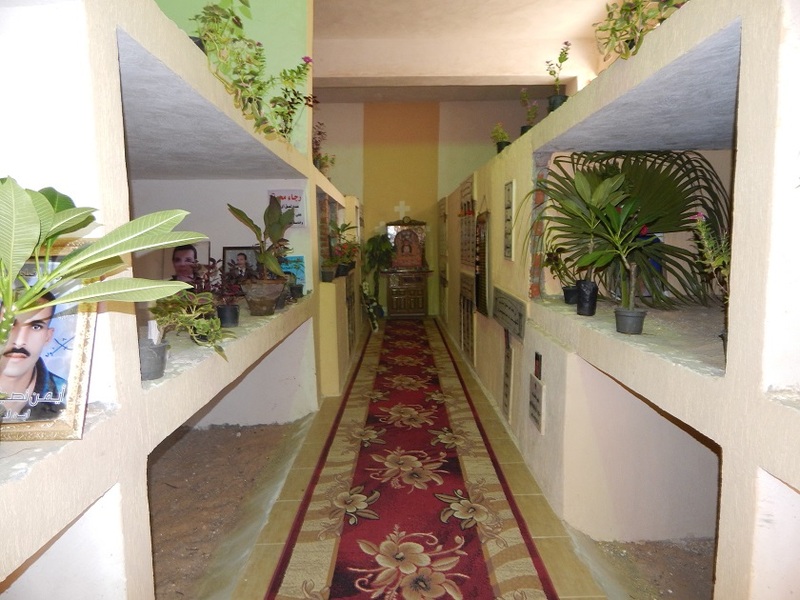 Inside the crypt of the Maspero martyrs. One must remove shoes before entering. 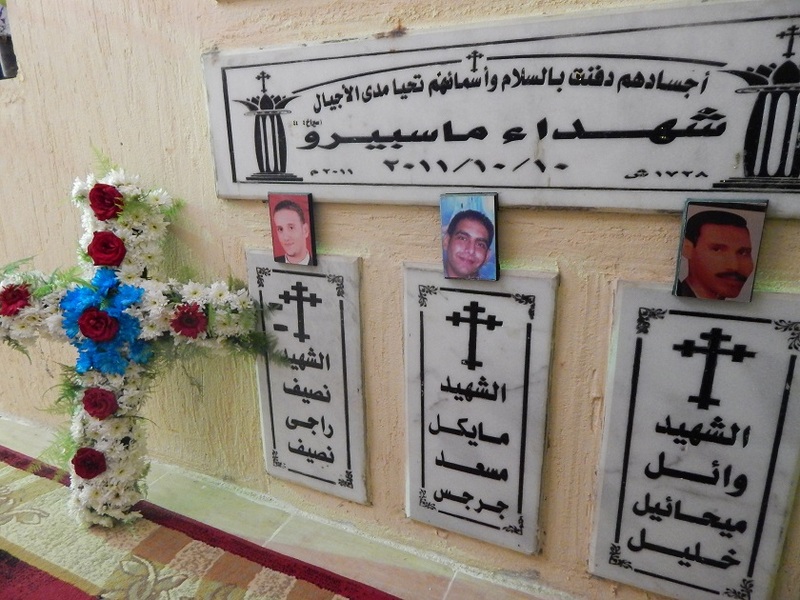 The plaque reads: The Martyrs of Maspero, with a date of October 10, 2011. One relative explained it is the 10th because that is when the autopsies were finalized, though the massacre took place on the 9th. The phrase above says: Their bodies are buried in peace, and their names live throughout the generations. Honored below are Nassif Ragi, Michael, Musad, and Wael Mikha’il. 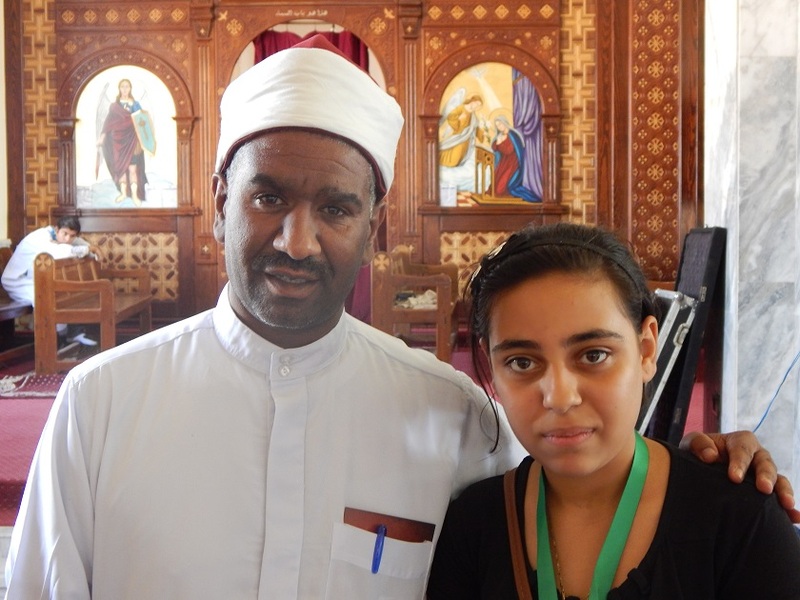 It has been a difficult three years for Egypt’s Christians, but also for her Muslims. At the end of the mass I spoke with Sheikh Ahmed Saber, who is the imam of a mosque near the Maspero Radio and Television building, the epicenter of the Coptic protests and the site of the eventual massacre. Over the course of time he has become a friend – first to the activists, later to the families – and was keen to be present at the memorial service. Ahmed Saber, with one of the younger relatives of the deceased. Unfortunately, he did not have much to say about the course of justice, preferring to make non-politicized statements. Perhaps this was wise – it just wasn’t useful for my article. But he also stated he was there in a personal capacity, not representing the Azhar institution despite his clerical garb. But it was acceptable the Azhar was not there, he said, for the church and Azhar agree upon 99 percent – which is citizenship, human rights, and social justice – and disagree about only 1 percent – doctrine. Therefore, he said, having official church representatives was the same as having Azhar representatives. Except, the official church representatives did not come either. Earlier it had been stated that the influential bishops of Central Cairo and Giza would be in attendance, but at the last moment they excused themselves due to travel necessities. 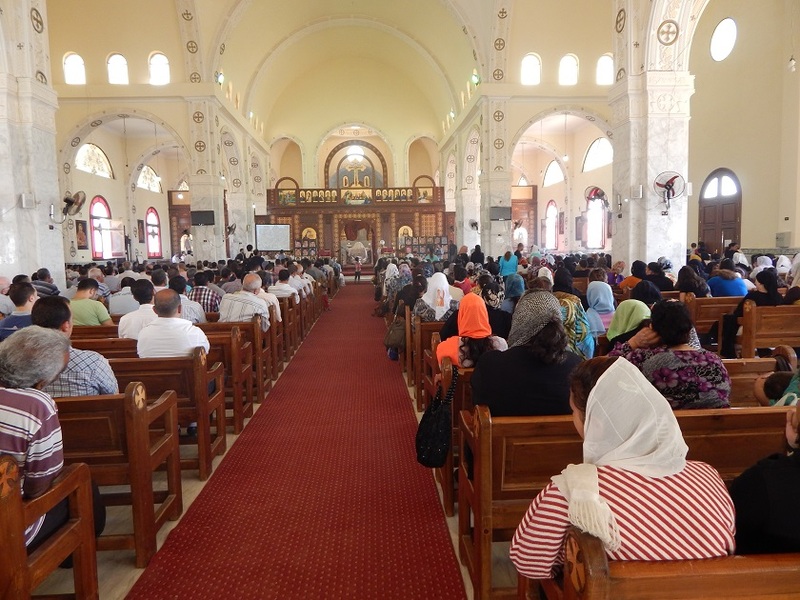 This seemed odd to me, but none of the Copts I spoke with were troubled by it, stating both were present at the 2nd memorial service a year earlier. Having now lived long in Egypt my mind flirted with the conspiratorial, but there was nothing to latch on to, so it also escaped my article. Another interesting comment from the sheikh was in relating an earlier conversation between St. Anthony and St. Boula, two of Egypt’s earliest monks. St. Anthony instructed him that Copts should pray first for the Nile, then for the ruler, and then for the patriarch. Sheikh Saber found this to be an example of wisdom, and elaborated upon it while quoting several Bible verses. He was certainly a unique individual. Muslims often attend special services in the church as welcome visiting dignitaries, but are invited or allowed to leave midway through before the serving of communion. Sheikh Saber remained politely the entire time. The three UFMM spokesmen were appointed by the families as they were the most active relatives working on their behalf, Saber said. This testimony was confirmed with others at the memorial service and was evidenced by a busload of relatives for whom he arranged transportation. But not by all. Fuad Attiya is the 69 year old father of Hady, his 22 year old son killed by gunshot in the demonstration. He invited the MYU to attend the church memorial service. Another relative told me Attiya provided for the light snacks shared by the martyrs’ families after the service. Perhaps this is not as strong an indication of support as the bus provided by Saber, but he did appear a respected senior figure to those I spoke with, including Saber. Attiya, however, did not confirm the ‘14 families’ idea spoken of by the activist, but he clearly was not happy with Saber’s assumption of leadership. Mina Magdy, general coordinator of the MYU agreed with Gaziri it was a day for the martyrs. They attended the memorial mass to express condolences, and left shortly after it ended. He is saddened by the accusations against the group and explained they have spent countless hours with Saber and the families to demonstrate their innocence. He believes lies have been told by the media to harm their organization, and many of the families have been taken in. He also thinks Saber is jealous of the MYU’s political influence, something he wants for himself. Saber admits he will represent the UFMM not just in matters pertaining to the justice of their case, but also as citizens about the affairs of the nation. He announced their participation in the June 30 protests that led to the military-backed overthrow of former President Mohamed Morsi, for example. Magdy made it clear to me they were not attending the mass to attract attention to themselves as an organization, but to participate in an event that devastated them as well. They left of their own decision, he said, so as to leave the focus of the day for the families, even though both Attiya and the priests conducting the service asked them to stay. 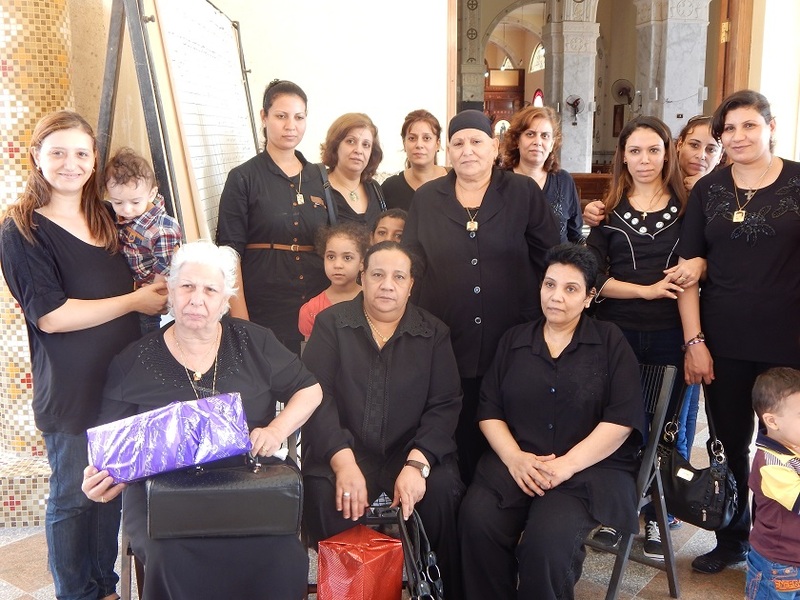 Relatives of the martyrs, dressed in black. I have known the activists of the Maspero Youth Union for a long time, and it is difficult for me to believe they have profited off the names of the martyrs. In human nature, however, anything is possible, and Magdy spoke of the privacy of the organization when I asked if I could review their financial records. He assured me, though, that they have shown bank reports and other evidence to the families. He will accompany them to court if any produce evidence of wrongdoing by any in the MYU, but so far no one has. Youssef Sidhom, quoted in the article, also stated that when his newspaper collects donations it makes them public and details the expenditures, so that all is done in full transparency. Unfortunately, many in Egypt’s activist spectrum – from the Muslim Brotherhood at one end to the Maspero Youth Union on the other – operate outside the structures of oversight and keep all their financial dealings in-house. Mina Thabet told me the donations the MYU helped solicit were processed through a certain priest, so there is a channel to follow up with these investigations. Wael Saber also stated that in order to cut out the ‘middle man’ of the MYU and others he printed with permission the phone numbers of every activist family, so anyone who wanted to help could do so directly. Here also is a channel to follow up on the counter-accusations that he is an opportunist. The families can be asked about him directly, which he invited me to do. But the whole matter is sad. Certainly if there is fraud, this is sadder still. And if Saber and others are deliberately marring the reputation of the MYU then this also deserves condemnation. There is that within me that wants to get at the truth of the story, motivated by a desire that a better understanding might overcome this animosity – or perhaps prove the worthiness thereof. But even the telling of the divisions I hope has a small impact on showing this ugly face to the activists and families themselves. The death of these 27 individuals was a tragedy; it deepens in sorrow with the witness of infighting. October 10 was also my birthday. After the melancholy experience I returned home and was received by my own family which does not suffer from so much division. Of course in comparison we have hardly suffered at all. 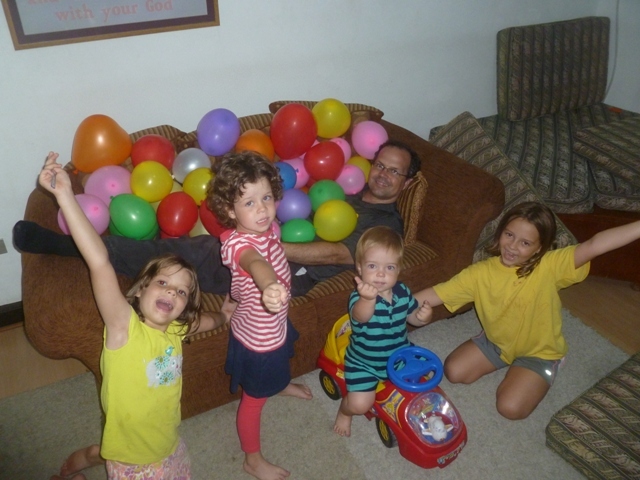 But as my children covered me with 40 balloons, I was reminded of the good gift of unity in a community of love. The bulk of my day was unsettling; the ending repaired all harm. I pray Egypt might receive a similar experience soon.